The farmers market schedule dictated that the first stop on Saturday morning would be Santa Monica, where there were actually two markets. The first was a very chilled scene at Virginia Beach Park, with a live band playing a trippy instrumental version of "Pumped Up Kicks". It was another very produce-oriented market with some cool varieties of mushrooms and radishes. There was just one food stall but the huge carne asada burrito I bought was the best I'd had in a long time. The main act on Saturday morning in Santa Monica is the downtown market on Arizona Avenue. It's a busy affair extending for several blocks with a mixture of growers and artisans. 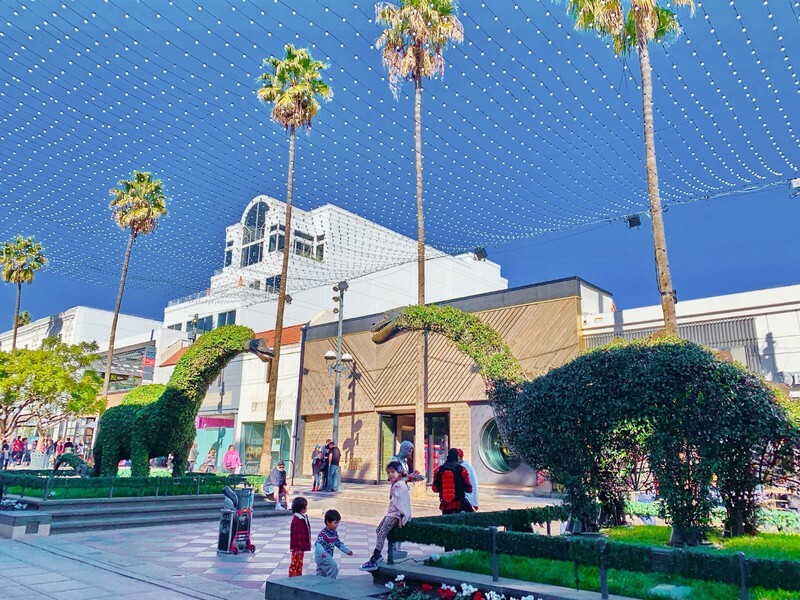 Halfway through is the intersection with Santa Monica's famous Third Street Promenade. 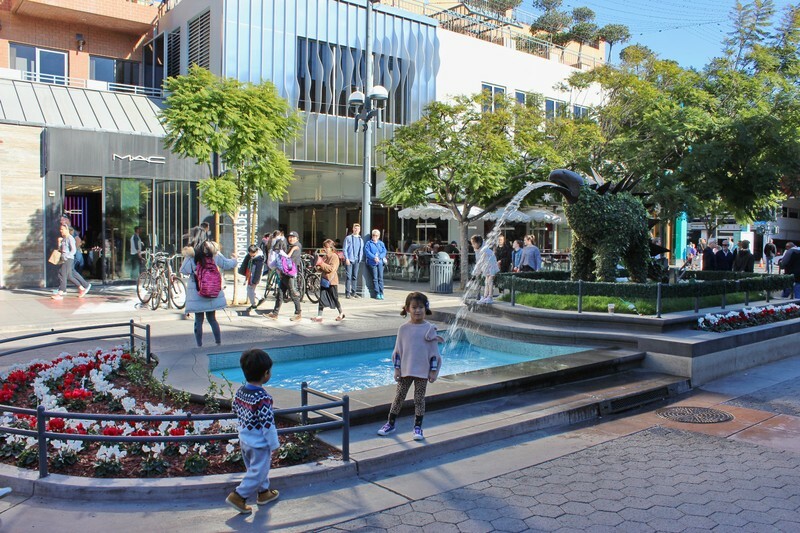 The Third Street Promenade is the place to shop and people-watch in Santa Monica. Aside from the cafes and boutiques, there's innovative landscaping and some very talented street performers. 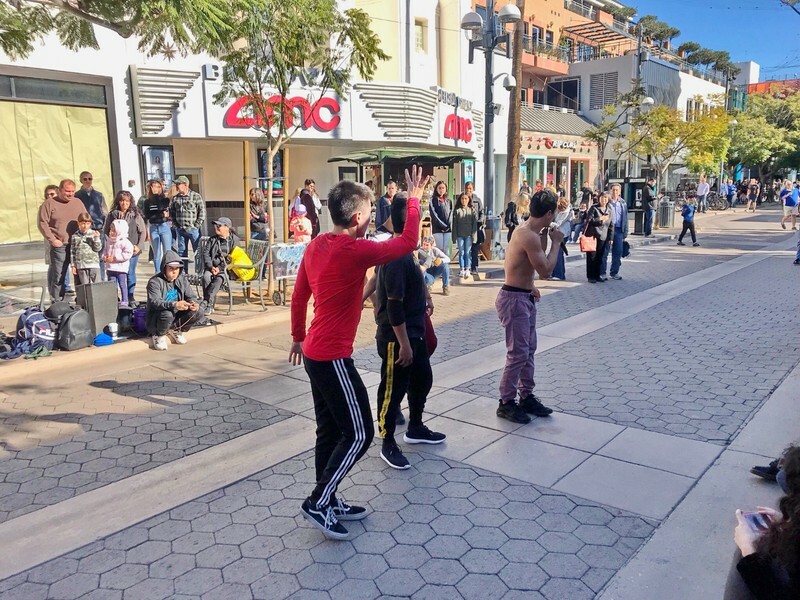 It always drives me nuts when people watch these guys for ten minutes and then walk away without giving so much as a buck, so I enjoyed the ingenious ways some of these guys induce people to pay for their entertainment. 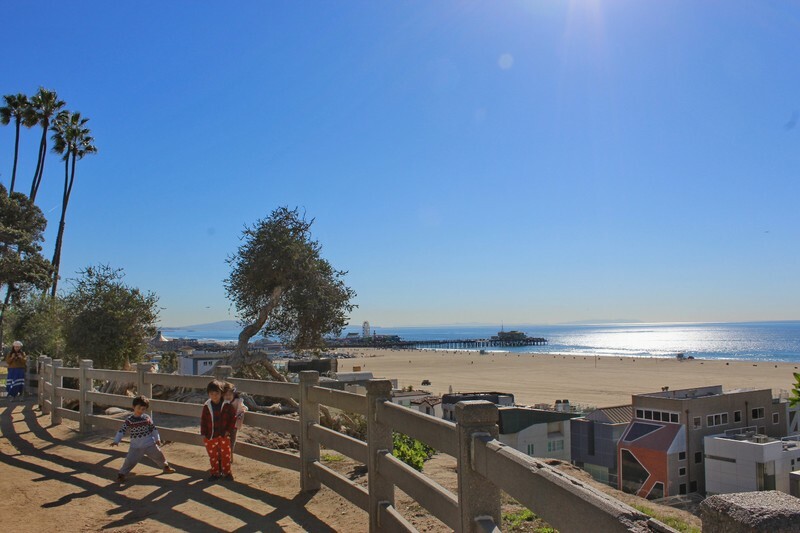 The promenade was only three blocks long and was lined with boring chain stores, so we reversed back to Arizona Avenue and walked a couple of blocks to the little strip of park that overlooks Santa Monica beach. To the south we could see the Ferris wheel on the Santa Monica pier. In the other direction we could see across Santa Monica Bay all the way to Malibu. On the beach was an array of no less than eighteen volleyball nets, none of which were in use on this chilly December day. We knew that going on the pier would inevitably result in at least a couple of hours lost to rides and games, and there just wasn't any time for that today. We managed to hustle the kids away before they spotted the Ferris wheel, but the catch was we couldn't find a decent place to eat in downtown Santa Monica that didn't have at least a thirty minute wait. I was desperate to get to Venice before sundown, so we bought the kids grilled chicken sandwiches and got back on the road. We made it to Venice quickly enough, but the kids had passed out after eating and I had to idle the car for a while until they'd slept enough. Then we had to find a place to eat for ourselves, which ended up being an odd little Chinese fusion place called Mao's Kitchen. The food was decent, but we had to practically run to the Venice Canals to see them before darkness fell. As it was, we had about ten minutes of dusk before we were completely enveloped in darkness. It worked out for the best though since many of the houses were still elegantly decorated for the holidays which made for a beautiful spectacle at night. We ended up experiencing the best of both worlds at the canals. Darkness and cold descended together and we hurried down to the Venice Beach boardwalk. Muscle Beach was already shut down for the night and there was little else to see. We decided to have dinner at Mitsuwa Marketplace, one of Southern California's many Asian supermarket chains. There's a choice of Mitsuwa for Japanese goods, Galleria for Korean, Seafood City for Filipino, 99 Ranch for Taiwanese/Chinese and other smaller markets for Vietnamese and Thai. Many of the larger supermarkets have food courts which can be among the best places to get authentic Asian dishes. We did pretty well at Mitsuwa, which wasn't much different from eating at a supermarket in Tokyo. Spenser especially liked the dried seaweed strips. I had another special event queued up for the next morning. Smorgasburg LA is a huge gathering of food trucks and food stalls that's held in downtown LA every Sunday. It sounded like a weekly food festival with live music and a general party scene, and I was really looking forward to kicking off our fourth day in a row with a bang. On the way there we stopped by LA's small Chinatown just for a quick look. The neighborhood was virtually empty on a Sunday morning. Unlike other Chinatowns in the US, many of the buildings were painted in bright colors and topped by ornate pagodas so that they looked more like the China pavilion at Epcot than China or the US. One of the central pedestrian streets is named Mei Ling way, so of course we needed a picture of that before we could move on. When we arrived at the Smorgasburg LA area, I couldn't seem to find the actual spot and there wasn't much pedestrian traffic around. Eventually a security guard confirmed my suspicion that the event was closed for the holidays. We were disappointed, but we knew it could have been a lot worse for us visiting LA between Christmas and New Year's. At least every farmers market and food hall had been up and running. We'd have to mark this one as an incomplete, but we already knew we'd be returning to LA within a few years. This would be just one more way to make the second visit unique. And on the plus side, this gave us the chance to make that return visit to Grand Central Market that we'd been craving. The Original Farmers Market isn't the city's only gigantic food hall. Grand Central Market in downtown LA also evolved from a public market that was established in 1917. The most recent influx of ethnic and gourmet food outposts began in 2013, coinciding with the international food hall movement. As soon as we stepped into the cavernous establishment with industrial decor, Mei Ling and I had to pause to catch our breath. Before us stretched a forest of colorful neon signs proclaiming the offerings of countless food stalls in a vibrant, open layout that extended as far as we could see. If the authenticity and quality of the food here matched the visual impression, we had arrived at food hall nirvana. For the next half hour or so, we toured the amazing selection of food stalls trying to decide how we were possibly going to choose what to eat, or really how to choose what not to eat. We ruled out the numerous Mexican options, given that we were going to visit a Mexican food hall in East LA later in the trip. Our first selection was a Salvadoran pupusa filled with our chosen selection of carne asada, nopal, and squash. The pupuseria was a particularly popular and energetic spot with a fairly long wait, but the savory tortilla stuffed with delicious meat and vegetables was more than worth it. We complemented the pupusa with a blisteringly spicy aguachile from the cevicheria next door. Once we found a table to enjoy our food, we noticed an enormous line snaking around the entire dining area. We discovered everyone was waiting to buy food at a restaurant called Eggslut at the south end of the market facing South Broadway. Given that hardly any of the other restaurants had a line at all, the lengthy queue for Eggslut was quite impressive. We tried to peek at what people were getting and all we saw were egg sandwiches and orange juice. Finally my curiosity got the better of me and I asked a couple of girls on the line whether the food was really worth the wait. They looked at me strangely. "It's Eggslut!". OK, I said. What's so amazing about it? "We haven't eaten here yet. But everyone says it's really good." I told them I was really surprised people would wait that long for an egg sandwich given that they were on the threshold of an enormous food hall with dozens of restaurants selling delicious preparations of every imaginable cuisine. It's the best food hall I've ever seen in the entire world, I told them. "Really?". They didn't sound excited. I'm sure it's a good egg sandwich, but there's no way it could be so much better than everything else on offer at Grand Central Market. It's a reminder that once something gets hyped on social media, it takes on a life of its own. I think at least half the people on that line were there just because the line was so long. Even after we were full we found it hard to leave. We took one last tour through the market taking mental notes which restaurants we would sample on our return visit. There would be plenty of chances in our three full days left in Los Angeles. We got some coffee for ourselves and treated the kids to a sugar rush at an old-fashioned candy stall that was just too beautiful to resist. 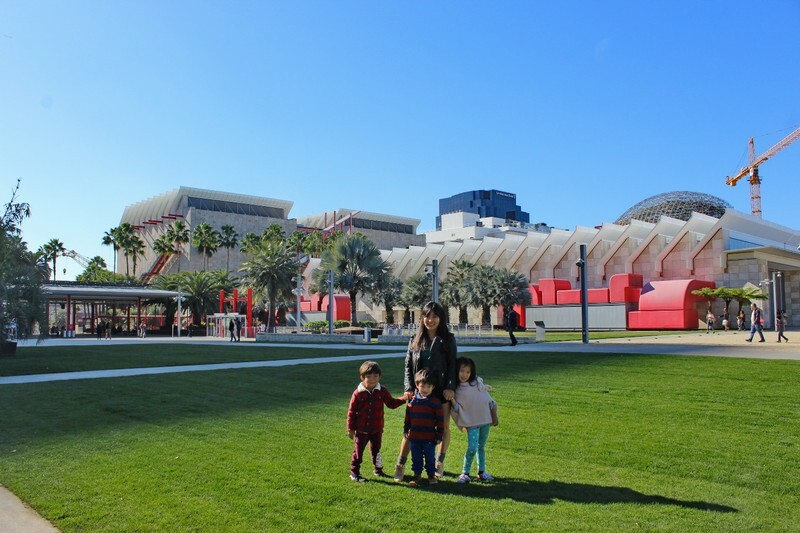 We had a narrow window of time to squeeze in a kids activity before Spenser would need to sleep so we raced north up the freeway to Discovery Cube, one of Los Angeles' many children's museums. The view from the road looked nothing like anywhere I've seen around the world. We were surrounded by low, brownish hills with very angulated, furrowed contours. It looked like a landscape one might expect in a place like Mongolia or Bolivia or possibly even another planet, but here we were just a few minutes away from central Los Angeles. The kids had a fun time at Discovery Cube. It was hard to get them out of the first area which had giant blue building blocks and a cupcake decorating lab. The biggest hits were the home inspection game and the hockey exhibits on the second floor that were funded by the Kings of the NHL. Overall I found it better than our Children's Museum in Miami but not as good as the ones in Houston or Milwaukee, and a far cry short of Experimentarium in Copenhagen. We'll have to try Kidspace on our next visit. Two of them within four days would have been too much. The Friday afternoon farmers market was in Echo Park, a hip neighborhood just north of our home base. Before the market, we checked out the Echo Park Time Travel Mart, a unique novelty store with a time travel theme and the memorable motto "Whenever you are, we're already then". Aside from the items related to time travel, there were some really cool games and projects for kids. I picked up a dinosaur model whose pieces were all punch-outs from thin wood sheets and a book of science experiments for the home. It's hard to leave without making a purchase. Aside from the fact that a lot of the stuff is really neat and useful, the profits go to the community reading and tutoring center 826LA which owns the store. Before we left, we made sure to take the opportunity to be the front window display for a few minutes. The Echo Park farmers market was a bit of a letdown after the previous day's extravaganza at South Pasadena, but I still got the chance to try some delicious Senegalese foufou. Dinner was still on the agenda, and there were two more food halls on my list in downtown LA. Corporation Food Hall is a fairly recent addition to LA's food hall pantheon, and it was surprisingly empty on a Friday evening. There was a relatively small collection of kiosks in a much more orderly arrangement than Grand Central Market. The place had a very modern, urban vibe with some whimsical touches. One of my favorites was the Italian kiosk Funculo, a play on the Italian profanity "fan culo" with a pair of forks displaying their middle prongs on the sign. The bar at the back presented their cocktail menu on old-fashioned View Master projectors. We had a pretty good meal of noodle dishes and gyoza. Hopefully the relative lack of custom at Corporation on the night we visited was only because it's predominantly a lunch spot for people working downtown. I'd hate to see such a unique establishment fail to establish a permanent presence in LA. The route to the other downtown food hall took us past Pershing Square, which was nicely dressed up for the holidays and had a busy ice skating rink at the far end. Despite the fairly heavy presence of homeless people in the area, no one seemed remotely threatening and we weren't bothered at all. The sidewalks were pleasantly busy with people who were out for the evening. It was markedly different from the evening scene, or lack thereof, in the downtown areas of Miami and other major American cities we've visited. We finally arrived at TASTE food hall but despite the sleek appearance of the mall that housed it, the culinary offerings were a disappointment. They were mostly higher quality chains with a sterile atmosphere, just a step above a regular mall food court. We'd only been in Los Angeles for two full days but we hadn't felt this thrilled about a new city in a long time. I was reminded of my first time exploring London with Mei Ling, and our visits to Tokyo and Prague. The best part was that my expectations had been so modest, which made the neverending awesomeness of LA even more satisfying. We still had two and a half days left, and many of the best experiences were still to come. This was our third Christmas break trip, and I needed a good follow-up to 2016's Nicaragua and 2017's Yucatan. I initially was set on Lima but eventually decided that our exploration of the city would be limited by personal security considerations. Having three small kids to manage would put a huge target on our backs for petty criminals. It was too soon to go back to Mexico or Central America, and it's really hard to get excited about the Caribbean given that we've already visited most of the larger islands. There was only one option within the US if we didn't want to get frozen solid, and that was Southern California. I'd been there a couple of times in my twenties, and never felt much affinity for the area. Los Angeles seemed kind of spread out, generic, and soulless. San Diego felt to me like a midwestern city transplanted to the Pacific Coast. But now, having explored most of the warm areas in the Western Hemisphere, it seemed like our best option. I knew there was a lot of Asian culture in LA and I figured that at the very least we'd be able to get some authentic Thai and Vietnamese food for a change. Once I started doing my usual advance research, I quickly realized we were going to find a lot more to do than eat Asian food. I was amazed by the number of ethnic neighborhoods I saw on the map, from Little Armenia to Filipinotown. I was surprised to find we would be within easy reach of a different farmers market on every day of our stay. There were also lots of options for kids edutainment, such as the La Brea Tar Pits Museum and Kidspace. 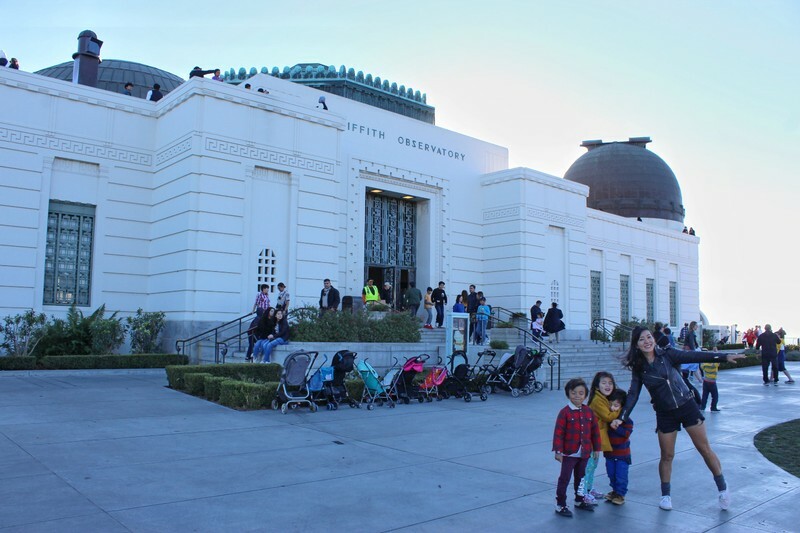 Finally, many of the nearby suburbs like Santa Monica and Pasadena have lots of attractions in their own right. By the time we were ready to go, I had a full schedule of activities for our four full days in LA as well as three days in San Diego. 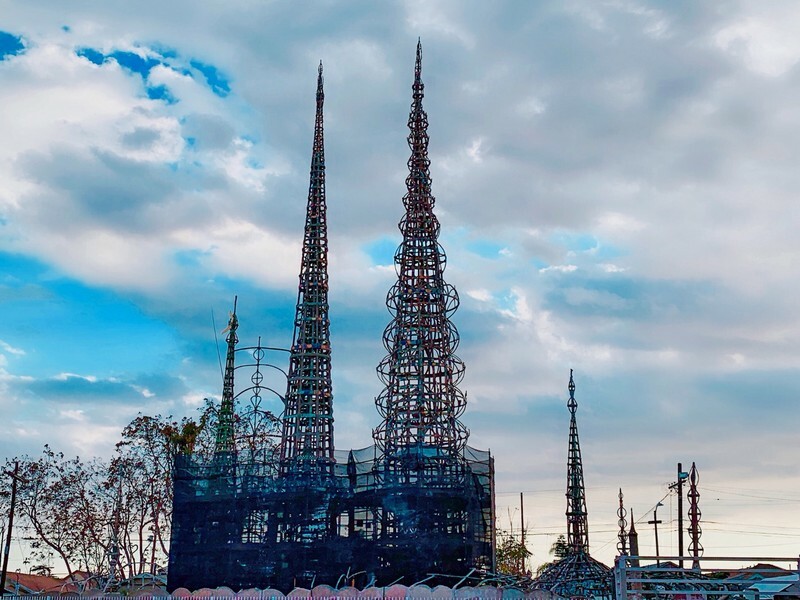 I'd created a daily schedule that was more rigorous than usual in order to minimize trips across the city that would expose us to LA's legendary traffic jams. We arrived in the early evening after a fairly rocky flight from Miami, and picked up our rented Ford Explorer uneventfully. I knew from the forecast that Los Angeles would be a lot cooler than Miami, but I'd forgotten how cold 50 degrees Fahrenheit felt when we were used to the 70's and 80's. We'd packed warm coats and long pants, but I hadn't brought anything but sandals and my feet felt frozen for most of the trip. We didn't have to meet our Airbnb host so we went straight to dinner from the airport. Los Angeles and San Diego have both been eager participants in the food hall movement, with LA particularly having an abundance of options. 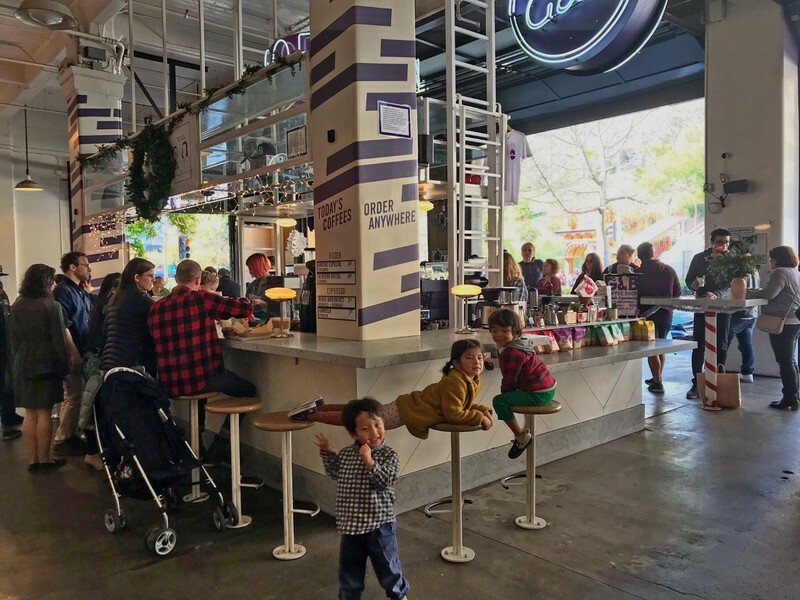 We love food halls because we can mix different cuisines into an amazing fusion dinner, there's great energy, and we don't have to worry about how much of a disturbance the kids are making. It was the perfect solution to fill our stomachs after an exhausting day of travel. The food hall closest to our Airbnb was called Squaremixx, a collection of small restaurants that are all franchises of Korean chains. While the food may not be the highest level of Korean cuisine, it's indisputably authentic. At one stall at least, no English was spoken. Squaremixx occupies much of the third floor of a shopping center called Gaju Market. The ground floor is given over entirely to a Korean supermarket which we browsed for half an hour after eating our fill. Los Angeles isn't a cheap place to stay, and over the last couple of years Airbnb has been catching up with hotel rates. However, Airbnb is still by far the best option for a couple with three kids since we need two bedrooms. The kitchen and large refrigerator are also indispensable, and we love the way Airbnb makes us feel like we're living in the city we're actually only visiting. I had a decent jump on the crowd and was able to get a great place in the central neighborhood of Westlake for just about $150/night with everything included. 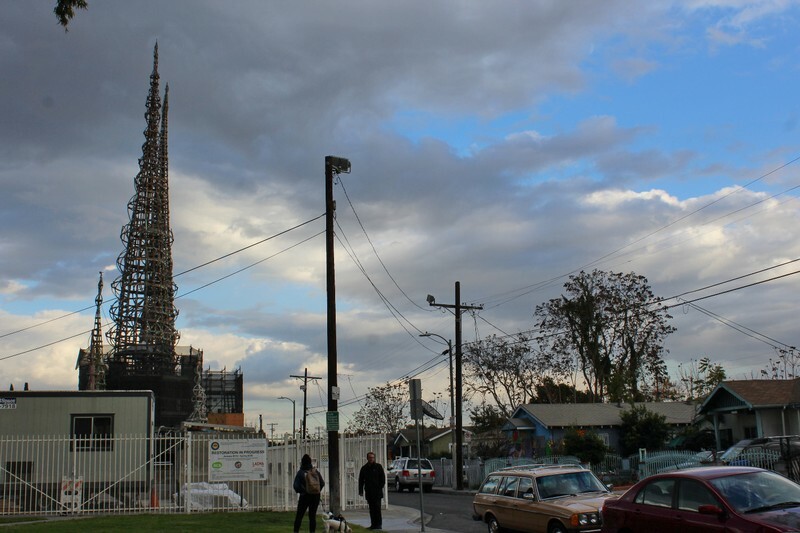 The area might have been a little working class for travelers who needed to feel submerged in LA glitz and glamour, but it was the perfect location for us. 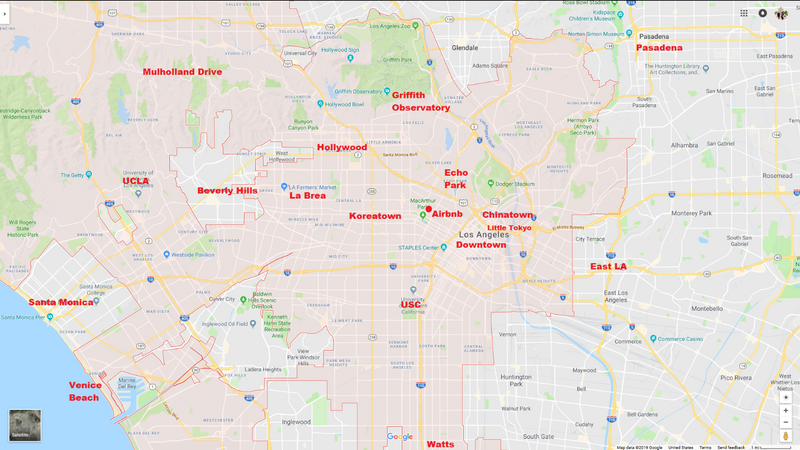 As one can see on the map, we were just a few minutes drive from all the amazing Asian neighborhoods in LA: Koreatown, Filipinotown, Chinatown, and Little Tokyo. We were also about halfway between Santa Monica and Pasadena, the two most far-flung suburbs that we had plans to visit. This made it easier to focus on specific areas of LA on each day of our stay and avoid the traffic. Our cottage turned out to be very pleasant, with a lot of character. There was a fire pit on the front porch which we never had time to use, a spacious living room, and two comfortable bedrooms. Space heaters in each room ensured that we wouldn't have to worry about the cold temperatures when we were indoors. The owners were collectors of old cameras, many of which were placed on the shelves around the house. A sign on the refrigerator reassured us that none of the cameras would be filming us during our stay, a possibility which had not occurred to me until I read the sign. Street parking proved impossible, but fortunately the hospital next door allowed long term parking for about 5$/night. We kicked off our first morning with a huge breakfast at Du-Par's. a 24 hour diner within the Original Farmers Market. The food was amazing, including possibly the best buttermilk blueberry pancakes I've ever tasted. I probably didn't push the kids to eat as hard as I usually do so that there would be more left over for me. The interior of the diner had a very classical, warm feel that made the meal even more enjoyable. 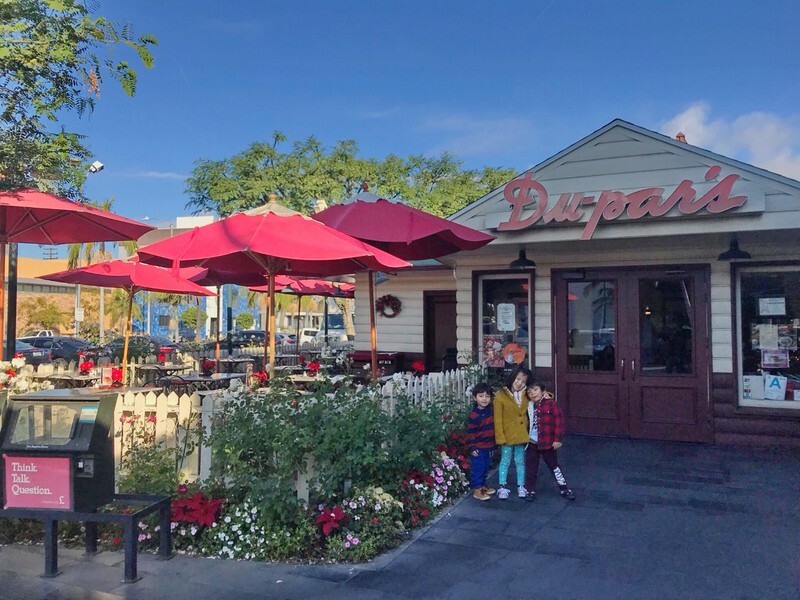 The back door of Du-Par's is also the threshold of the Original Farmers Market, where there are no longer any farmers but rather a large array of specialty restaurants, gourmet food vendors, and some miscellaneous boutiques thrown in. Many of the food stalls looked so appetizing that I regretted having gorged myself at breakfast. The Cajun food and the French seafood restaurant that was attached to a fish market were particularly appealing, but the quantity and variety of restaurants was overwhelming. Since we couldn't eat any more, we spent a half hour in the French gourmet market Monsieur Marcel, which had the same ownership as the French restaurant and fish market. The employees were very gracious to the kids, who were high on sugar and insisted on touching and demanding samples of practically every item in the store. After we were sure we'd explored the entire market, we left but vowed to return for dinner at Monsieur Marcel. The video is actually from our return visit a few days later. Just a couple of minutes south of the Original Farmers Market are the famous La Brea Tar Pits and museum. We spent some time in the pleasant park that the museum shares with Los Angeles County Museum of Art, which is a beautiful building surrounded by some interesting landscape art. The Tar Pits themselves aren't much to see, being fenced off and largely obscured by leaves and grass, but the museum has a very unique design. The ground level containing the exhibits is encased within a shallow hill reminiscent of a primitive burial mound. At the top of the hill is a metallic ceiling structure with relief images of Pleistocene mammals. From here, one can look down into the central atrium of the museum. The kids couldn't tear themselves away from rolling down the hill until their clothes were coated in broken grass. Inside the atmosphere was mainly that of a kids' museum, which was fine by us. The kids mostly ignored the static displays and skeletons in favor of interactive exhibits like a mammoth tusk battle and the animal poop quiz. The gift shop was a big hit as well. After La Brea we had a couple of hours to kill before our first farmers market, and the perfect piece to fit into the gap was the Griffith Observatory. The observatory is a Los Angeles landmark, visible high up on Mount Hollywood from most of the city. Griffith Park itself is an amazing feature of Los Angeles. It is one of the country's largest municipal parks and contains the Greek Theatre, the Los Angeles Zoo, and countless miles of hiking trails. We had fairly easy driving until we got into the park at which point traffic slowed to a crawl. It took another half hour to reach the observatory, where we found the entrance to the parking lot barricaded and police directing cars to continue down the road to a large parking lot at ground level. It took another twenty minutes or so to hike back up to the observatory but the effort was more than worthwhile for the glorious views of Los Angeles which unfolded beneath us. The observatory was ferociously crowded, to the extent that movement was difficult in the anteroom containing the Foucault pendulum. I'm not sure if it's always like that, or if it was just a function of the holiday season. I found myself wishing that there had at least been a nominal admission fee to diminish the hordes. The indoor exhibits looked interesting, but trying to keep my eye on the kids amid the throngs proved too stressful and we quickly found our way to the observation decks. Oddly enough, the famous Hollywood sign isn't on Mount Hollywood but rather Mount Lee to the west. Never fear, Mount Hollywood is the one with actual views of the sign. The observatory had several decks, with the wind getting steadily stronger and colder the higher we climbed. It was all worthwhile because the views of the city kept getting more amazing. There aren't many major American cities I can think of with mountains close enough to give a view of the skyline. I was impressed by how restricted the skyscrapers were to the downtown area. The rest of Los Angeles looks practically rural in comparison. I already mentioned that there were so many farmers markets in and around LA that we were able to visit one each day of our stay. Why do we care about farmers markets when we travel? It's the embodiment of our anti-tourism travel philosophy. Aside from satisfying our love of food and its diversity, farmers markets are great places to interact with locals and people watch. They're also often a good alternative to a restaurant meal when you have three ebullient, squabbling kids. The best market I could find on a Thursday was in South Pasadena, just outside the northeastern boundary of the City of Los Angeles. Although it was 12 miles away, it only took us half an hour to get there. In fact, we never encountered any of the horrible traffic that LA is famous for. Maybe it was because we were there between Christmas and New Year's, or maybe we were just lucky. Somewhere along the way I spotted an odd statue of a man or troll diving down a wall next to a disembodied fist which may have been punching through. Was it a recent commentary on the border wall controversy, or something older that was completely unrelated? We only had a moment to snap a picture from the window, and I wasn't able to discover anything about the sculpture online afterwards. The South Pasadena farmers market was huge, one of the biggest true farmers markets I've seen in the United States. The large majority of stalls were devoted to produce and all of those were operated by the actual growers. The diversity and quality of the fruits and vegetables were awe-inspiring, and the neighborhood was beautiful. At the back of the market was a collection of food stalls and food trucks that was a level above the usual simplistic tacos and fried foods. We had finally finished digesting our enormous breakfast and we were ready to try out the selection at the market. The combination of barbecue, Thai soups, and Mexican food was so good that we obliterated any chance of going out for another meal that evening. By this point is was dark and getting steadily colder, so we were happy to call it a night at seven. Even though it was early, we'd done far more in our first day in Los Angeles than on an average day of travel.